Today’s marketing landscape is very wide and full of choices for marketing professionals. Marketers today have more tools, more channels for promotion and even more audience base. Marketing has evolved to omni-channel levels. Campaigns are designed one time and thereafter run seamlessly on multiple platforms that interact consistently with potential customers to provide better brand experience. Through marketing attribution, marketers get the benefit of understanding the performance of their marketing efforts and monitor its progress for corrective actions. 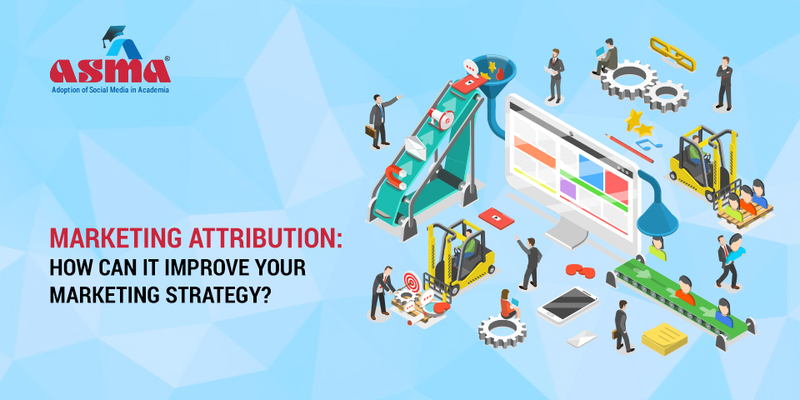 What is Attribution in Digital Marketing? In simple terms, marketing attribution helps to analyse the various touch points that influenced a customer’s purchase decision. These touch points can be many, from traditional to the latest digital channels. Marketing attribution can be a powerful tool for marketing professionals to track performance of their efforts and use the insights to create campaigns directly accentuating marketing ROI. As per experts in the industry, brands have seen a gain of 20 – 30 percent in media efficiency and corresponding increases in ROI after implementing attribution models. Attribution provides a much richer view of the buying process of the customer. It therefore lets marketers to choose the right channels of promotion and allows to run more precise campaigns on each channel. They can use campaign insights garnered through attribution to increase efficiency of their marketing interfaces on multiple platforms. Marketing attribution can tell you the highest engaging touchpoints. It can help you identify look alike audience to increase targeting outreach. Marketing attribution models can also help determine what should be the optimal campaign spend across channels. In this way, marketers can remove lot of bottlenecks in justifying the marketing ROI. Marketing attribution helps in detailing of each individual campaign working under overall campaign strategy. This allows marketers to make marketing strategies that are truly effective on every level. Until very recently, calibrating online and offline advertising investments based on probabilistic marketing models did not yield valuable insights regarding effectiveness of different advertising channels. Hence understanding consumer behaviour accurately was a challenge. However, with marketing attribution, professional marketers are able to forecast future business performance and adjust their budgets accordingly to achieve better outcomes. The advent of digital media has enabled marketers to access highly customized insights of their campaigns on real-time. Because these insights are immediately accessible once the campaign goes live, marketing professionals can use them to optimize performance of campaign deliverables ensuring the maximum possible return on investment. Marketing attribution has empowered businesses to drive the most effective analytic strategies combined with multi-channel marketing using digital data. Previously very few companies had the data infrastructure needed to guide marketers for developing effective campaign strategies. But now, companies have started investing in that make an upfront investment in big data analysis to benefit from various marketing campaigns. For deriving long-term value from your campaigns, you need to first set key marketing performance objectives to achieve and then use attribution techniques to build on the right strategy. Applying attribution tactics provides end-to-end analysis of the marketing lifecycle. It assists marketers to drive effectiveness and efficiency of their media mix. Every insight along the marketing lifecycle will help in boosting campaign performance, identifying loopholes and taking corrective actions. It further helps to know which audiences are most receptive and which channels and tactics are most effective. So, What’s Your Attribution Strategy? Marketing attribution is a relatively new phenomenon in marketing. Since the advent of digital marketing, businesses are using attribution models to measure performance of marketing campaigns and are also seeing its benefits in improving ROI. To get the most from attribution, companies must also ensure that their marketing programs have the built-in flexibility to accommodate real-time analytical insights. This may even require them to re-allocate marketing properties in the budget depending upon their performance. So what’s next? As digital channels continue to proliferate, media budgets will become more accountable. Marketing attribution will need to further simplify the whole marketing ecosystem. Digital platforms will have to be integrated with attribution methods to ensure that analytics are used in real time. Henceforth, successful marketers will be those who can create an integrated and holistic attribution strategy that uses tactical insights to generate real business value.